360 Image Media and RTV virtual tour software announce another impressive technology launch.360 Image Media is pleased to offer all of our Wisconsin Real Estate professionals, who utilize our professional photography and virtual tour services, more ways than ever to market and view their real estate listings for sale. 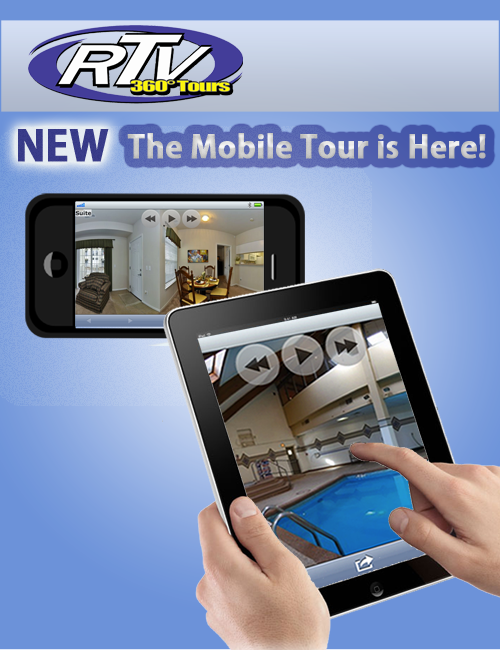 Announcing the all new mobile tours, thats right. I-Phone, I-Pad, Android, Blackberry, and other smart phone’s, you can view all our virtual tours and slideshows on mobile devices. What extra work does this new technology require on your part? Nothing, 360 Image Media has done everything for you, it just works! This makes viewing your tours and slideshows even more accessible than ever before. We are also pleased to announce the release of QR codes. What is a QR code you ask? QR codes are a new 2 dimensional barcode that allows you to market listings even more easily than ever. We create the codes and supply you with the image to use on your sign riders, flyers, or print advertising. How do they work? Well people that have smart phones can simply scan the QR code and it will take them to your listing information or tour. So anywhere they are they can view your listing. These two offerings alone would allow us to continue to dominate the Wisconsin Virtual Tour, and Architectural Photography market. But thats not all, as Steve Jobs would say But Wait There’s More. 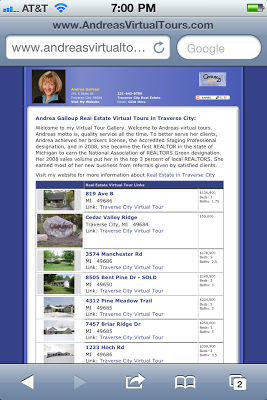 We have also finalized our new Wisconsin Real Estate For Sale blog, so now with our tours or exposure engine your listing will be posted to our Wisconsin Virtual Tours blog and also now our NEW Wisconsin Real Estate For Sale blog as well. So double the syndication, double the exposure. There it is another amazing announcement from the leading Wisconsin Virtual Tour Photographers, and Real Tour Vision. Always bringing our customers the industry leading virtual tours and property marketing. Call or E-Mail Today to see how we can help you sell your properties. This mobile exposure provides the perfect opportunity for our customers to start using QR Codes in their marketing packages. Because of the customization and flexibility of the RTV hit reporting system users will be able to track the number of times virtual tours are accessed by the scanning of a QR Code! This amazing feature has RTV providers from around the world cheering and will certainly turn heads as provider marketing campaigns get underway. Watch the video below as Jason LaVanture explains how to create a QR Code for an RTV virtual tour that has QR Code tracking enabled. Enjoy the new technology RTV! Real Tour Vision virtual tour software company did it again. The development of the mobile HTML software that allows our 360 virtual tours tours to run on iPhones makes realtor’s mobile websites even more efficient for our customers. Right now the realtor can place a rider sign on his listings that will not only show the listing with the map and only a photo of the listing now the customer will be able to see the whole tour of the property on his/her smart phone. If you will like to see how this product looks in your phone just type this URL http://rtvpix.com/RE-4305-0UTQ6D-01 on your smart phone right now and check it out! Just place a rider with your mobile website address on each of your listings and you will giving an astonishing service to your clients but you will be to contact the prospect that is just seeing your listing and help him/her become a proud owner of a new home. To see an example just send from your smart phone the following message bluelava6 to 43766. If you like it and vill like to order your own mobile website click here. This technological breakthrough places our company once again as the best virtual tour and Internet marketing provider in the market. This technology is also available on our newest product the HD slide shows. For all your Internet marketing and virtual tour needs just call 305 331 8960 or contact us on the web. How many of you remember when you had to crank the phone to get an operator that will place your call (I don’t either but I’ve seen it in movies)? Or when land line phones changed from the rotary to push button numbers. I bet there isn’t many of you had a home phone that shared the phone line with the neighbors. Communications have come a long way in the last 40 years. It wasn’t long ago the cell phone weighed in at 20 pounds or more. The cost of a call was huge and you needed two jobs just to afford making calls. That is all in the past and now you can use your cell phone (that fits in your shirt pocket) to browse the web, send emails, text your family and search for a home. Virtual tours are now on your smart phone, you can have a Realtor site or visit a Realtor website and view homes while having dinner with your family. How cool is that? If you could place a bid on a home from your cell phone that would make them perfect!